He doesn’t have superpowers. He might fight for the right, but “fighting” is really a stretch. More like he stands up for it when the chips are down. But he’s also in a small town where the conflicts are more personal than really struggles between good and evil. That small town? It’s also pretty idyllic, though it still has its haves and have nots, and it doesn’t seem to have villains so much as occasional jerks. No, with rare exceptions, the adventures of Archie have never been writ large. And yet over a year ago when Archie Comics published his “death” (set years in the future), writer Paul Kupperberg laid out the case for exactly why we all treasure a character like Archie. Maybe we all just expected him to be around, taking him for granted. Well, they were right. 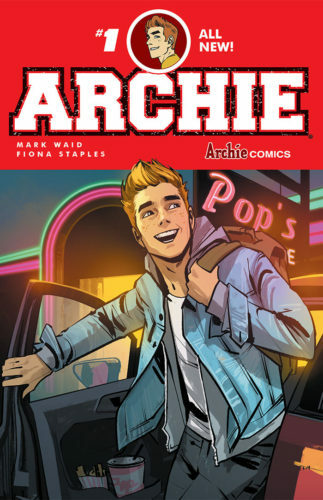 Archie did need a refresh, and Waid and Staples have started us over with a Day One that makes Archie Andrews feel like a typical American teenager in 2015. Surprising but welcome, this is also a story without Veronica. The classic love triangle will show up eventually, but Waid is taking his time in recreating his cast and taking this back to basics. Archie and Betty have been friends since they were five years old, and we visit Riverdale right after they’ve broken up. Of course the high school is buzzing with gossip and plans to reunite them. But there’s a pain here for both, and Staples portrays it beautifully without overplaying it. With Staples’ art, this book should attract the right target of teen readers. Though a bit stylized, her characters breathe, with a realism to them that only a top-notch cartoonist can achieve. Her portrayal of Jughead keeps all his trademark features but looks like somebody you would actually meet — more effectively than Francesco Francavilla did inAfterlife With Archie. Even if you don’t know the cast, the characters all stand out. Reggie has the right slickness, and Betty the sweetness, though with a tinge of sadness through Waid’s plot. And Archie? This is a kid you want to know. That makes it sound like it’s aimed at the people who grew up with the character, but the publisher’s intent is to allow a new generation to grow up with him. 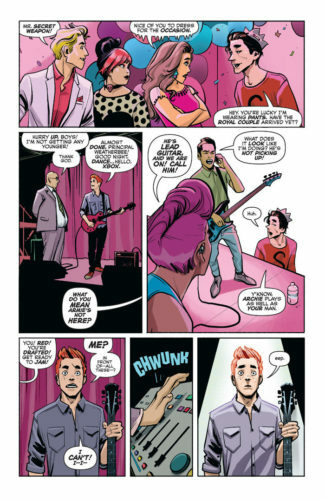 Waid gets it off to a good start — younger readers can recognize their own motivations in the well-meaning machinations of Archie’s friends, and Archie himself speaks directly to the reader. It’s a technique not just borrowed from reality television, but from a slew of Disney and Nickelodeon sitcoms. Kids are used to it as a device, and Waid uses it sparingly. Mostly, he lets Staples tell the story. And you should let her tell it to you, too. It’s a gentle story, but a good one. Whether you expected it or not, Archie is simply a good comic. Not bad for a guy who was born in 1941.